Anwar Sadat was an early participant in anti-colonial activities against the British-sponsored Egyptian monarchy. He became vice president under Nasser, and inherited a deteriorating relationship with the USSR when he transitioned into the presidency. The Soviets refused Egyptian demands for increased economic and military aid, and the Egyptians were trying hard to keep a foot in both camps. In reaction, Sadat expelled the 5,000 Soviet military advisors and 15,000 air force personnel in Egypt. After the brokered Mideast peace following 1973 war, Sadat became convinced of the need for closer relations with Washington. Another in a long line of annoying, unspaceable US Mid War 1 Op cards. 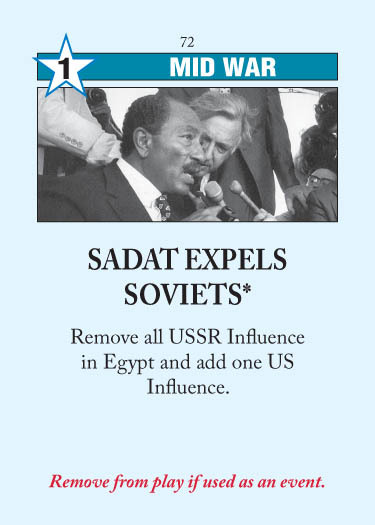 Coupled with Camp David Accords, Sadat gives Egypt to the US, throwing a wrench in your Middle East Scoring or OPEC plans. But you don’t really have any other options — sometime in the Mid War, Sadat almost certainly will be triggered. So it’s better to plan for him in advance: if the US breaks control of Egypt with Camp David Accords, I don’t bother reinforcing it if I’m going to be expelled by Sadat soon afterwards. For the most part Sadat can be effectively neutralized by keeping either Nasser or Muslim Revolution in the deck. This is a great event if the USSR controls Egypt, and almost always worth triggering. It is better to play Camp David Accords first, then Sadat, to keep the Sword of Damocles Sadat hanging over the USSR’s head. This entry was posted in Mid War, US Events and tagged sadat expels soviets. Bookmark the permalink. Sometimes, as USSR, you can headline this and then coup.